The Cubs future looks bright with Kris Bryant, Addison Russell, Kyle Schwarber, and many other young potential superstars, but they have their future catcher developing in the minors and should be up in 2-3 years if he continues to progress. Montero will be gone after the 2017 season. That is when his contract is up and that is when Contreras will take over the reigns behind the plate. Finally, the catcher is Willson Contreras and he had a successful 2015 campaign at double-a. Contreras played in 126 games while hitting .333 (151-454) and dropping 8 bombs on the opposition. He also tallied up 75 RBIs, 57 Walks, 62 K’s, 4 stolen bases, 71 runs, 4 triples, and 34 doubles. Contreras also started 75 games at catcher and 8 games at third base. Contreras first started his minor league career as a third baseman in 2009 and then converted to catcher in 2012. He reminds me of Russell Martin because he started his career as a third baseman and converted to catcher. He was signed out of Venezuela as a third baseman. First, Contreras is more of a hitter, but can hold his ground defensively as well. He gunned out 27 of 70 base runners in double-a. He accumulated a lot of experience this past season by catching 641 innings and had a fielding percentage of .987 (8 errors). He played 75 innings at third base. In addition, Contreras should start next season off at triple-a with his great 2015 season. 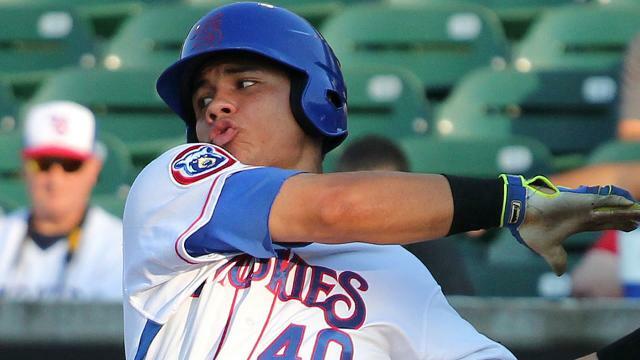 Contreras this year was ranked as the fifth best catcher in the minor leagues and the Cubs 10 best prospect. Contreras will remain behind the plate throughout his career because he plays the position well and is the best in house option for the Cubs. Also, because he has a strong arm and that he is quick too. Just needs to improve more on his receiving skills. The 23 year old will learn quick. Contreras will be a 15 homer guy and hit at a consistent .270-.280 average on a annual basis.